The Live-bearing aquarium commonly known as the livebearer comes from various fish families with the popular home aquarium species belonging to the family Poecilidae. 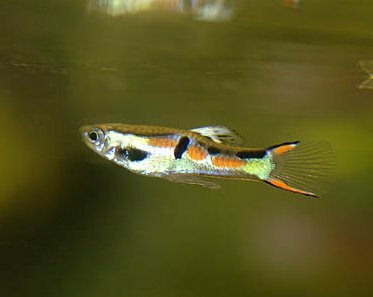 The family Poecilidae is large and contains various types of live bearing aquariums like the Guppy, Molly, Swordtail and the Platy fish. However, other families of the livebearer species are usually bred by experienced aquarists although the practice is rare. Some of these livebearers which can be kept by aquarists include the splitfins, halfbeaks, the “four-eyed” Anableps anableps and freshwater stingrays. The fish species including the Any Endler’s Livebearer which is native to Venezuela waters are known as 'Class N' Endlers. However, Any Endler's Livebearer with unknown origin but appears to be an Endler’s Livebearer characterized by the fish’s shape, size and color is group under the 'Class P' Endlers while those crossed with various livebearer and have unique coloring is placed and referred to as 'Class K' Endler. The Livebearer fish does not lay eggs, instead it retains the eggs in the body to give birth to a live, free-swimming offspring. The eggs are fertilized inside the body of the female Livebearer with off-springs developing inside until they become large enough for birth. If you consider keeping the Livebearer fish, it is important to note that both wild and cultivated domestic species can do well in home tank aquariums. However, the cultivated species cannot be bred in the wild due to the fact that they are usually equipped with traits which make them an easy-target prey for other wild fishes. In order to successfully raise the Livebearer offspring, you may need to place a breeding trap inside the tank or any other aquarium in order to separate the female livebearer from the offspring. However, placing the trap too soon can cause the fish to stress. In some cases, a separate bare-bottomed tank is used to separate the female Livebearer immediately after giving birth to off-springs.